Let me get right on that! While going over the survey answers, I tried my best to keep an eye out for trends that could help me figure out what users truly want out of KitchenPC. I believe I get enough traffic now to create a strong user base around, so it’s just a matter of building a product people love which is useful to a wide variety of people. I’m fairly confident the data I seek is encoded within the depths of the survey results, so now it’s just a matter of extracting it and doing something smart and businessy. What better way to gather my thoughts than to go over the survey results in a blog post, so exactly that will this post be. Sorry guys, it’s very long. 1) Where did you first find out about KitchenPC? Most responses to this question were too vague to do any real data mining around. Several people said “don’t remember” or left it blank. Other popular responses were “email”, “link”, “online”, “search”, etc. Very few people actually named any sort of website. This is just as well as Clicky and Google Analytics both let me mine referral links. 2) What really interests you in a site such as KitchenPC? This question was designed to get a good grasp of what users expect what they go to my site. I figure everyone has some sort of goal, which they hope KitchenPC can help them accomplish. I was quite curious if their goal is searching or meal planning, as it really affects the future of the site. The huge surprise here was the 58% that said, “I just want to find new recipes to try out, I don’t care about the meal planning stuff.” Seeing how the entire point of my site is “meal planning,” it’s pretty disheartening to find out over half my visitors don’t really care about that aspect of the site. 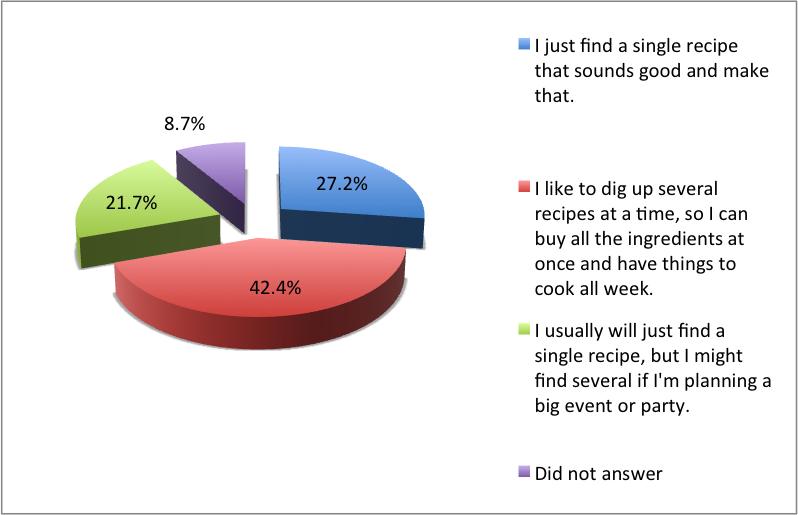 However, 59% said “I want to use up leftover ingredients in my fridge, or find out what I can make with ingredients that are on sale.” This means the meal planner code was not a total waste; a common goal of my typical user is to find uses for certain ingredients. 48% said “I want to become more organized in my meal planning by using the calendar and shopping list features.” Hmm, perhaps we have an even split. 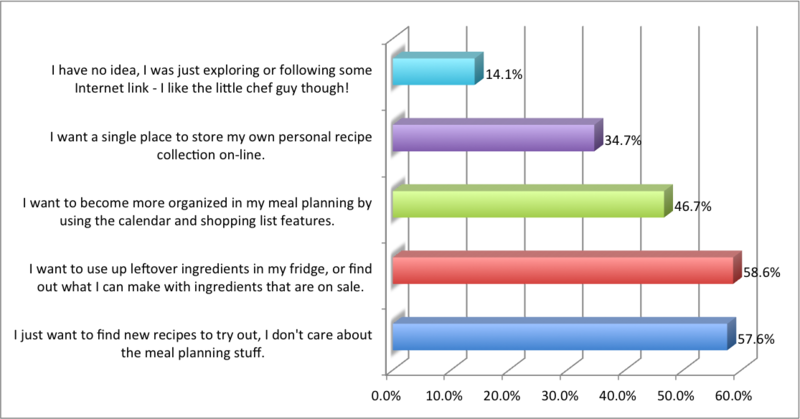 A little under half my users wants to become more organized in their meal planning, and a little over half just want to find great new recipes. 35% checked “I want a single place to store my own personal recipe collection on-line.” This tells me there’s a bit of interest in uploading or storing personal recipes on the site, but the amount of friction required in doing so scares almost everyone away. There were several comments from people who were meaning to do this, just hadn’t gotten around to it yet. The question is whether or not it’s worth developing these features to appease around a third of my users. There’s a lot of great data buried in these answers. Perhaps meal planning can be made a lot more passive and less “in your face” through a re-design of the interface. Is scheduling what recipe to make on each day really useful to anyone? At the very least, it’s clear that my goals need to align with powerful recipe search, while still targeting scenarios demanded by at least the casual meal planners. This might be a tricky balancing act, involving trapezes and stuff. 3) Feel free to go into a bit more detail on your initial reaction to KitchenPC? There must have been some reason you bothered to create an account, right? When a user takes the time to sign up on your site, it means they have an expectation of what they can get out of it. There exists an “ideal” implementation of your service within their imagination. Questions 3 and 4 are designed to capture those expectations and gauge the level of disconnect between what the user thought KitchenPC was and what it actually ended up being after they used it a bit. Correlating with the data from question 2, the majority of users mentioned finding or searching. Quite a few commented on the pleasant UI and overall look and feel of the site. One comment that really stood out was, “I wasn’t too impressed when I first found it. Glad for this email to have me come back. You have done untold hours of work and I will definitely be using the site more!” Perhaps I am getting somewhere. One user commented, “…when I started looking around at all the ways you could use this site to get more organized, I realized it was way better than the other sites I was currently using.” They went on to mention how useful it is to plan out meals in advance and create shopping lists. Another user commented, “I really like the shopping lists I can create on KitchenPC. I also like having a place I can put my recipes when I have time to create them.” Several others mentioned the shopping list feature, which is not surprising as it takes such a prominent position in the UI. There were also several comments from “meal planners”, who were drawn to my site as a tool to help them plan meals in advance. So, these answers are obviously all over the place. It’s of course impossible to please everyone, but what generalizations can we make about what people are looking for? Obviously, people are intrigued by the idea of planning out meals and finding out what they need to buy. Overall, people seem to “get” the site. However, the site statistics show me that people aren’t really using it. Shopping lists are mostly generated from a couple recipes, most users have never used the pantry, and almost no one actually uploads a single recipe. With that said, the ideal of becoming an organized meal planner still exists. Can KitchenPC do something to help these people? This question follows the previous one to basically ask, “ok so what did you think?” Did that ideal implementation of KitchenPC in their head match up with what they actually found? Did I totally screw up everything? Did the user completely waste their time, or am I actually on to something? In general, most of the feedback to this question was positive. There were, of course, a few honest criticisms as well. Unfortunately, the negative responses lacked actionable criticism; though it’s apparent recipe quality is still an issue. I have a feeling that will be an ongoing effort for quite some time. Other sites like AllRecipes and Epicurious can solve this issue through crowd-sourcing. Crap recipes get buried in the pile, where the best recipes get high ratings and lots of comments and surface to the top of any search results. 5) Which of the following more closely describes how you decide what to cook? I figure out what I want to eat first, and then I go to the grocery store and buy the ingredients required to make those things. I dig around my fridge or pantry to see what I have, then I figure out what I can make with those ingredients. I absolutely loved the results here. 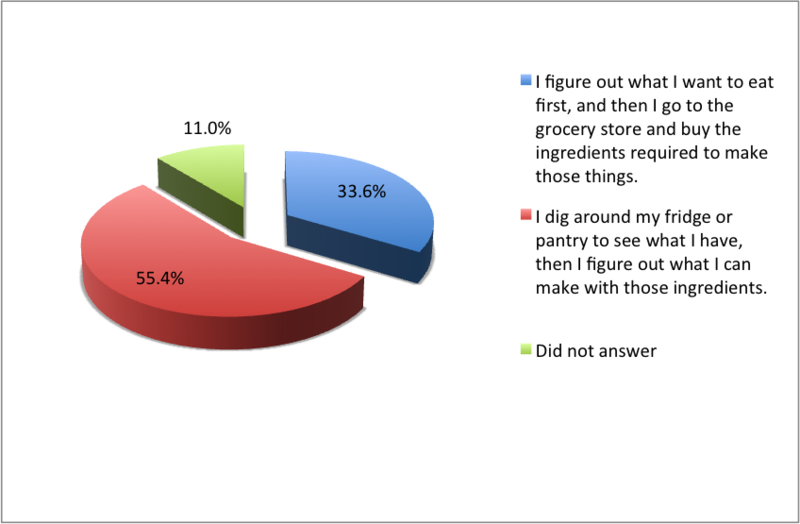 56% of users chose the latter, indicating they want to make use of their available ingredients, while only 33% said they figure out what to eat first and then go buy stuff to make it. This makes the meal planner that much more important, as it’s incredibly clear people want to use up leftovers and not make unnecessary trips to the grocery store. 6) When you search for new recipes on-line, which of the following best describes your behavior? I love the fact that the more rare case is finding a single recipe at a time. KitchenPC really shines with its ability to work with multiple recipes at once. This is a strength I don’t really think any other recipe website has, but users clearly want to work in this way. Users don’t work with recipes one at a time; they’re looking for things to make in the upcoming future. They’re looking to pair items with other items, and looking to make use of ingredients they have available. They don’t want a single recipe that calls for parsley if it’ll just be used once and then sit in the fridge for weeks. 7) Where do you keep your favorite recipes so you don’t forget them? 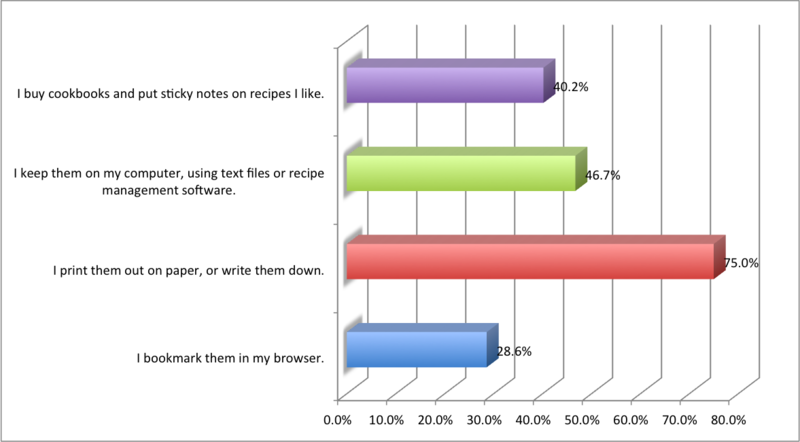 Only 29% of people will bookmark recipes in their browser. A surprising 75% of people will print them out on paper (I was shocked by this statistic!) and 47% store recipes on their computer in files. 40% use cookbooks and will put sticky notes on recipes they like. It’s definitely clear that KitchenPC needs to be really good at printing individual recipes, sets of recipes with a shopping list, and entire meal plans. Since nearly half of people have files saved on their computer with recipes, it seems being a “cloud storage” for recipe files might be a pretty solid business model as well; especially if I can mine and parse those files intelligently. 8) How often do you find yourself “improving” on a recipe, or jotting down personal notes or annotations? This question also changed a lot of my views. 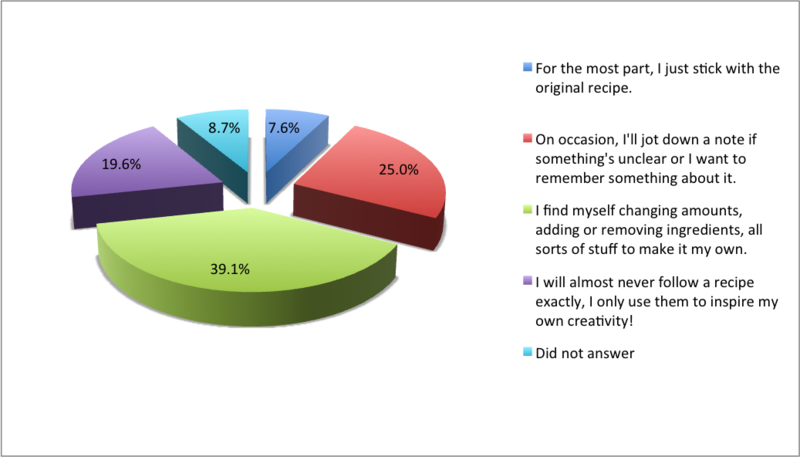 Only around 7% of respondents said “For the most part, I just stick with the original recipe.” This was quite eye-opening! People obviously want to personalize recipes online, jot down notes, change things, and make recipes their own. Obviously, the majority of users need to create notes on recipes and personalize things after they try them. These sorts of features need to be a huge priority in the upcoming versions of KitchenPC. 9) We’re planning on completely redesigning the way you search for recipes with KitchenPC. In your opinion, which features should we focus on? I will admit I want to make KitchenPC the most powerful recipe search tool on the Internet. This means I want users to be able to find recipes in any way, no matter how obscure. This question was asked mainly to get UI feedback. Obviously, no one wants to see a daunting page layout with a million different dropdowns, checkboxes and input controls. Searching needs to be simple, intuitive and fun. I plan on using this feedback to do UI wireframes for the next generation search page. 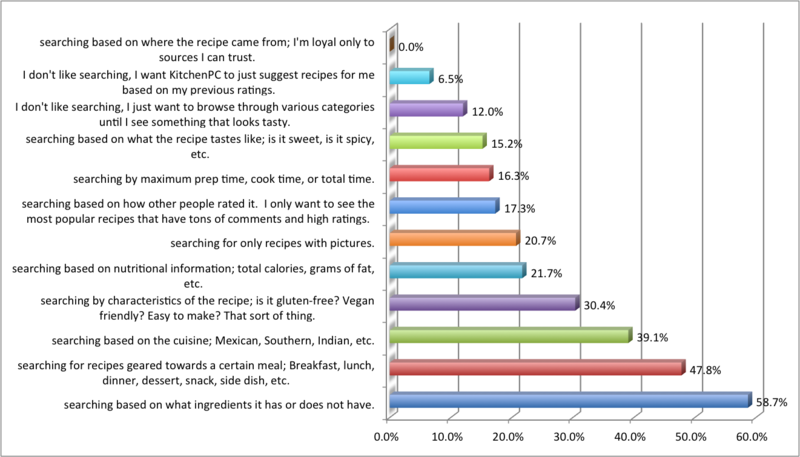 So what are the top three ways users want to find recipes? First, I left the plain old textbox style Google search out because that obviously needs to be front and center. Out of the choices I gave, the top (with 59%) was to be able to search based on what ingredients the recipe has or does not have. Second, with 48%, was to search for certain meals; such as breakfast, lunch, dinner or dessert. Third, at 39%, was to search by cuisine: Mexican, Southern, Indian, etc. Only around 16% cared if they could search by maximum preparation or cook time. Only 15% wanted to search based on what the recipe tasted like (sweet, spicy) – take that Yummly! A mere 12% wanted to browse through recipes by category, and a shockingly low 6.5% wanted a site to suggest recipes to them based on their previous ratings. Either people just don’t trust that, or they just love to search. Out of everyone that took the survey, absolutely no one checked the box “searching based on where the recipe came from; I’m loyal only to sources I can trust.” Though I was surprised to get 0% on this one, the low value didn’t surprise me much as most people I’ve talked to say they find recipes using a search engine, such as Google or Bing. Though I want to allow searching across all these dimensions, I could see a UI that would just allow keywords, meal, and what ingredients to include or exclude. All the other options would be accessible through a popup or hover-over interface to “add” new criteria to the search. 10) Any other comments on how we can make KitchenPC the most powerful recipe search engine on the Internet? This question gets straight to the point. Obviously, an online meal planner isn’t going to reach mainstream adoption without the recipe searching firepower to attract the masses. So, what exactly do I need to do to make KitchenPC beat out every other way to find recipes on the Internet? I guess I’m on my own with regards to search design. I have a feeling this will be perfected over many iterations of the site, and will rely on advanced recipe parsing techniques to really pull in the required metadata to allow KitchenPC to fully understand a recipe. 11) Regarding KitchenPC’s shopping list feature, which statement do you most agree with? 15.2% – This feature isn’t useful, who needs to manage a shopping list on-line? 54.3% – The shopping list feature is useful for creating a one-time list of the necessary ingredients for one or more recipes on the site. 23.9% – I would use the shopping list feature to manage my entire life – I want to be able to add non-food items, access this list from my mobile phone, send it to my spouse, etc. This feedback pairs absolutely perfectly with the real database usage at the moment. Almost everything on the shopping list is indicative of recipe aggregation, not “casual” shopping list management. 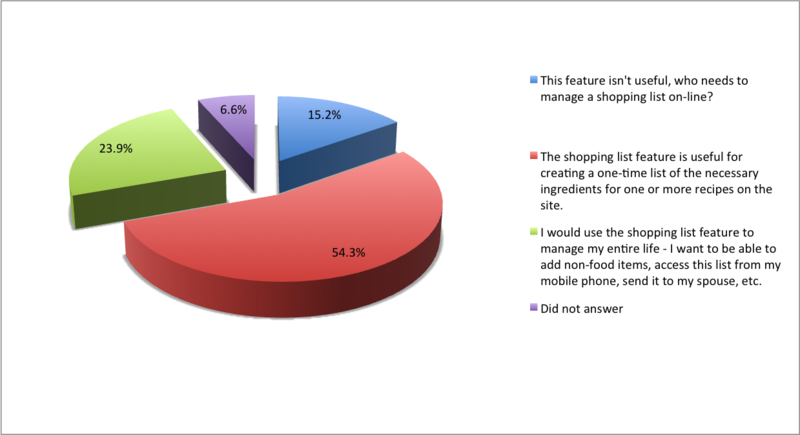 In other words, users are not interested in using KitchenPC to manage their shopping list online or manually entering staple items one at a time. There’s about a billion iPhone apps for that, and most people just use a scratch pad on their fridge anyway. What is apparent, however, is using the shopping list engine for the purpose of glancing at a tally of ingredients across multiple recipes. And the types of ingredients I see in currently stored shopping lists backs this up. I might even go so far as to say storing a shopping list online is useless (unless it’s heavily tied to a mobile presence or smart kitchen appliances); real time cross-recipe ingredient totals would perhaps be much more useful. 12) If KitchenPC started offering free, pre-built meal plans which contained 3-5 recipes along with a shopping list of what you needed to buy, what types of plans would you be interested in seeing? As announced previously, pre-built meal plans is one of the super high-priority features I’ve been planning for quite some time. AllRecipes already has it, but their implementation is messy and serious data overload. I thought I’d take the time to ask users what sorts of meal plans they’re interested in so I can begin to prioritize this effort. By far, the winner was “Healthy recipes! I want to eat better, and have a balanced diet.” with over 67% checks. Following that was “Meal plans that make great use of a small number of ingredients – I only want to buy like 10 things at the grocery store, and cook for a week.” with just over 55%. Obviously, people are concerned with being healthy and saving money. Wait, I needed a user survey to find that out? 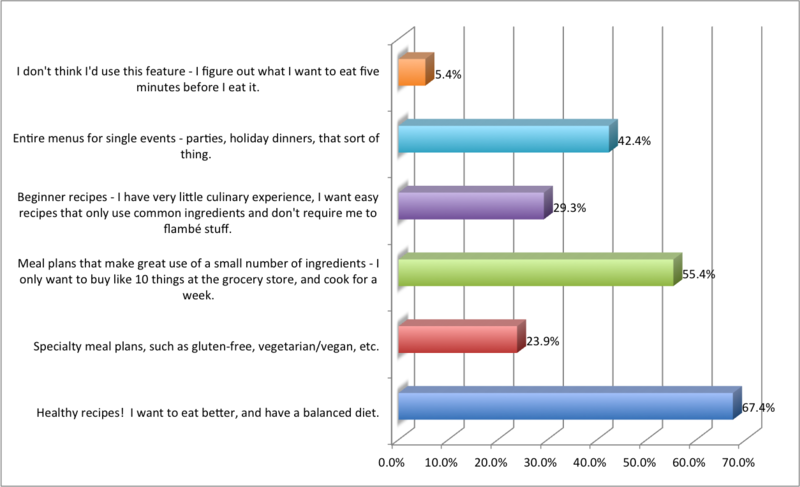 24% wanted “Specialty meal plans, such as gluten-free, vegetarian/vegan, etc.” and 29% wanted beginner recipes that were easy to cook. 42% wanted entire menus for single events (parties, holidays, that sort of thing). The icing on the cake here was that only 5% answered with, “I don’t think I’d use this feature.” Clearly, there’s a huge demand for these sorts of pre-build meal plans; the Internet is just waiting for someone to do it right. 13) Any other comments on pre-built meal plans? The comments here also aligned with the typical user being health and budget conscious. “I shy away from recipes with huge ingredient lists, especially ones with specialty spices that I don’t regularly use and would not buy for one recipe,” replied one user. 14) Now’s your chance to really wow us with your ideas and win great prizes! Did any of the above questions get you thinking? Which direction can we take the site in to really make you a regular user? This last question was where I wanted users to just go overboard with all sorts of crazy ideas and feedback. It was there chance to just give it to me plain and simple; what’s it going to take to turn you into a regular user? What can I do to turn you into a fan, so you’ll tell all your friends about the site? Most comments were about keeping things simple, not to “bother” users with constant emails or deals on fancy new kitchen gadgets, or just general ideas for what they’d like to see. Again, many ideas around saving money, eating healthy and high quality recipes. While reading these comments, it became somewhat clear that users don’t actually want a site with hundreds of thousands of recipes. They want a site with high quality recipes that are well written, easy to follow, cost effective to make, and taste great. People don’t want ten of the same recipe, or random junk that no one is ever going to make. Seasonal metadata is definitely something I’m planning on adding to the database, and this could also be accomplished through seasonal pre-built meal plans. Great ideas! Another great comment, which I saw alluded to several times in the feedback, was regarding single people. Though people cooking alone may not be my main demographic (though I’m one of them,) I think I could have an entire meal plan section for single serving recipes. These recipes could be quick and use common, non-perishable ingredients, or they could be easy to freeze and re-heat later. I could see the potential for single cooks flocking to my site in great numbers if I could pull this off right. This, again, could be accomplished through pre-built meal plans. I could see an “appliance” section and a meal plan for things to do with your ice cream maker. Searching based around appliance would more likely require metadata on recipes that would be hard to index or acquire, but it’s definitely something to think about for the future. It seems a lot of people think I can just magically know everything about a massive database on recipes, or that I have a team of people who can go through these recipes one by one and grep for any sort of culinary information I require. Oh well, I like that they dream. This request is basically a marriage of my recipe modeling engine and pre-built meal plans. And the answer is absolutely! In fact, it would be a waste if I did not do exactly that! I love the idea of seeing a pre-built plan, but the user hates one of the recipes. They simply click “Thumbs down” on it, and the meal planner is loaded and finds a suitable replacement that will use the same ingredient overlap. One user went all out on a randomized splurge of culinary vision. For my site to truly wow them, they’d like to see cooking videos, voice input of ingredients, cook-offs, forums, recipe swaps, great phone apps, coupons, articles on how to eat right, and automatic ingredient substitution. I’ll see how many of those I can get to in the next ten years. One user really did a nice job laying out the exact UI flow they want. Well don’t fret, I plan on making it very easy to do exactly this, and for free! However, donations are always appreciated. Ok, that was a boatload of information. It’s extremely difficult to zoom back a bit and look at the big picture, rather than micro-analyzing each little response. If I tried to cater to everyone who took the time to provide feedback, I’d need a team of 20 developers and two years of development time. I think the general idea is people want to quickly find great recipes, figure out what they’ll be making during the week, and finding out what they’ll need to buy. While doing this, they want to save money by making the best use of what they have, stay healthy by finding recipes that cater to their dietary needs, all while expanding their culinary horizons. Furthermore, they want to easily remember recipes they liked, jot down notes and make modifications to recipes they’ve cooked, and store their own private recipes online easily and without fuss. Ok, well that’s easy enough – let me get right on that! This is really great insight into ‘food searchers’. Thanks for taking the time to write it up.